This small car camper is unbelievable. It’s a really really small car and the owner has put every feature into it. The downside to the size is that you have to convert the car for every different feature. But he has managed to squeeze in a bed, shower, kitchen, and his drums. It’s a hatchback car so when you open the back it becomes sort of like a galley in a teardrop trailer. 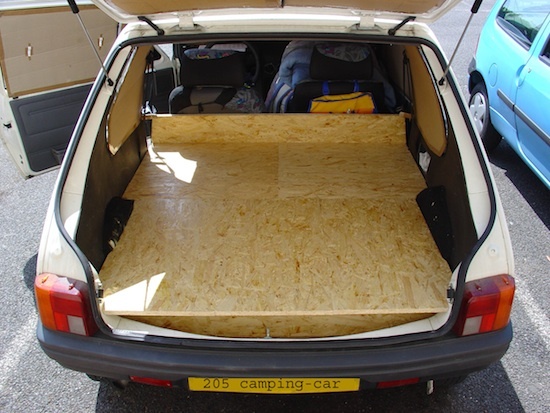 Below is the set up of the base of the car for storage and sleeping platform. Join our free daily tiny house newsletter for more! This could be the answer to homelessness. I have traveled in my car and in rentals. Old cars to be scrapped with a good body and glass could make a unique”tiny” community. But campgrounds didn’t want me staying in my car. This would be great if it could be cosidered self_contained. Which seems they were. To solve the problem of not being wanted in campgrounds I just stay in the tent camp and put up a kiddie tent as a decoy. I like to sleep in my minivan on road trips. I reserve tent camp sites at KOA’s and have never had a problem. I like electricity, a hot shower and a safe site so I don’t boondock very often. A lot of people are traveling in cargo & mini vans and enclosed pickups. Only the fancy RV Only campgrounds would object. No decoy tent needed. Also, in a car you can stay in most Wal-Mart parkinglots without any trouble.